It's another week with Your Next Stamp's Friday challenge. 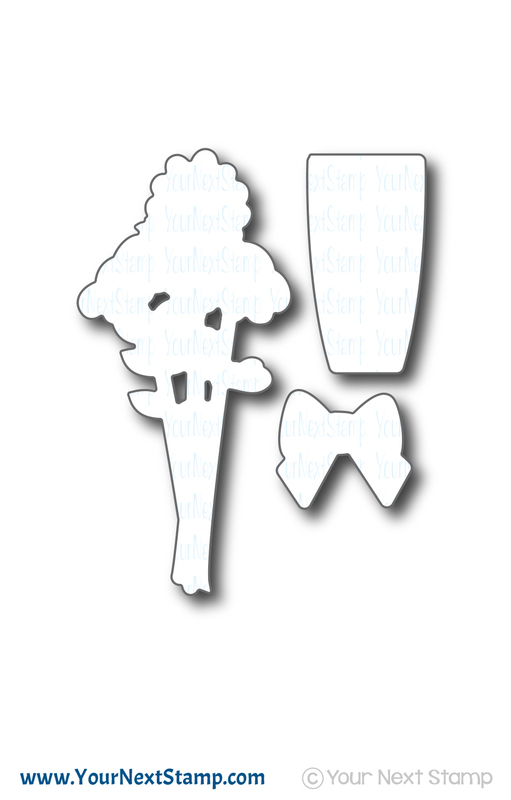 There is a super fun sketch you can play along with that leaves you with much white space for a multiple of ideas. 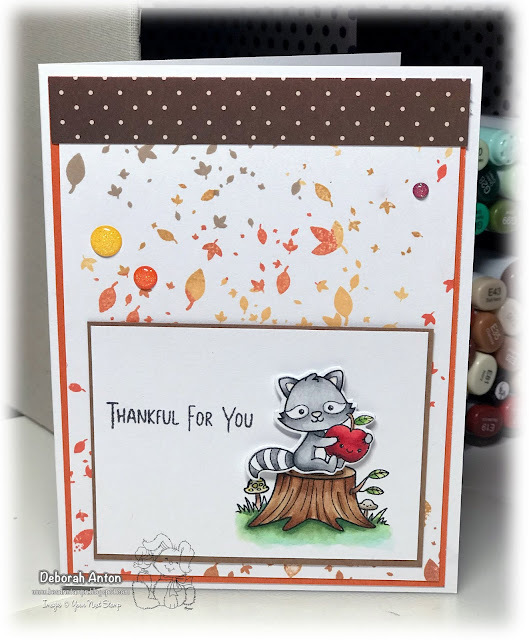 For my card, I am using the super cute set of Autumn Animals. I am not quite ready for Fall, but since it will be here before you know it, I might as well begin on some projects with that season. I stamped the background with the Autumn Leave Ink Splatter background stamp in various Memento ink colors. The image was stamped and colored in with Copics before cutting out that cute raccoon out with the coordinating die set. The stump was stamped directly onto the panel and colored with Copics as well. I popped up the raccoon and stamped the sentiment directly onto the top panel. 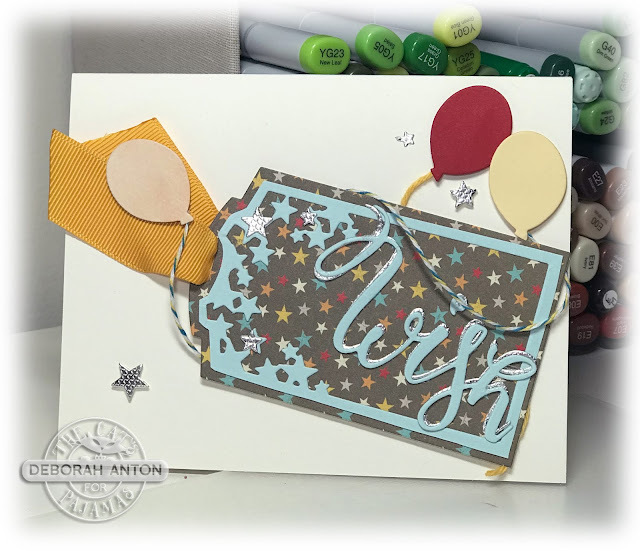 Using a piece of patterned paper from the YNS Fabulous Fall collection, I added a strip to the top before finishing the card with a few Sunset Sparkle Gumdrops. Thanks for stopping in and hope you have a wonderful holiday weekend! Hip hip hooray! It's new release day (and the first day of school for us!) 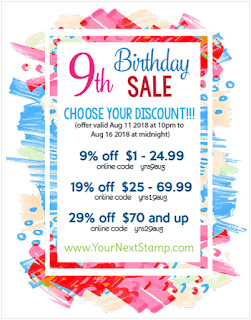 with The Cat's Pajamas Stamps and this month we are celebrating birthdays. You can never have enough fun birthday options when creating so as you hop along, you will see some super fun sets and CutUps. If you came here from Brenda's blog, you are in the right place. If not, start back here at Christine's blog. My first card is using some new CutUps of Wish Tag Duo and Birthday Set to create a fun tag card. I cut out the tag using some MME patterned paper and add the top frame with some solid cardstock to fit. 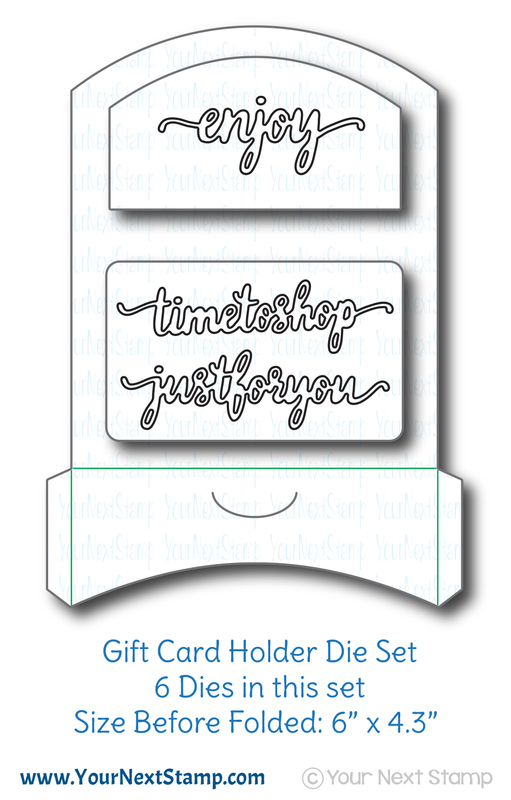 I then cut out the upper tag with some metallic silver cardstock to layer the sentiment over. I then added a few silver stars as well to accent. I added some ribbon from my stash and cut out the balloons to be popped up from behind with some fun bakers twine. My second card is using the super cute and fun set of Let's Party paired with the Balloon Frame CutUp. Now, I did notice as I posted this that I have my watermark on here twice and one of them in smack dab in the center of his mouth! Oops! I must have added that twice and didn't realize it. I kept this one CAS. The image was stamped and cut out, colored in with Copics. I used the frame to cut out the center and popped that panel up over the base. I popped the image in the frame tucking in one paw in the back and adding some stars to the top near the cake. 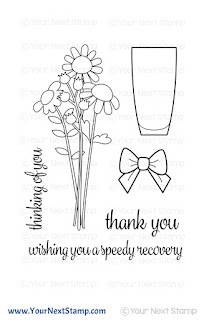 The card with finished with the sentiment. 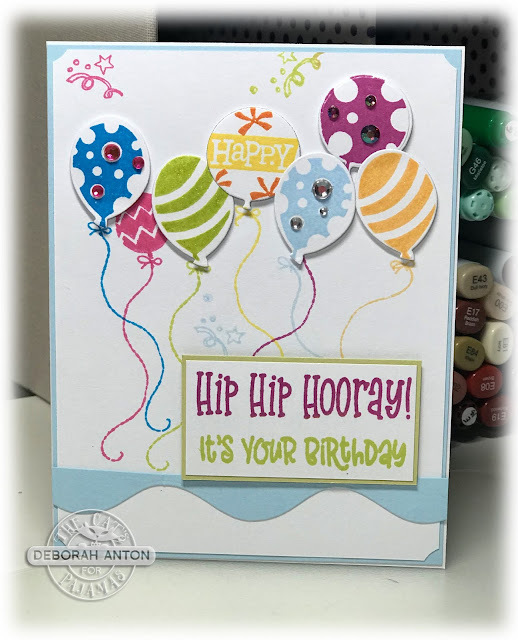 Now hop on over to Lynn's blog for more fabulous birthday inspiration. Thanks for hopping in and hope you have a great Tuesday! 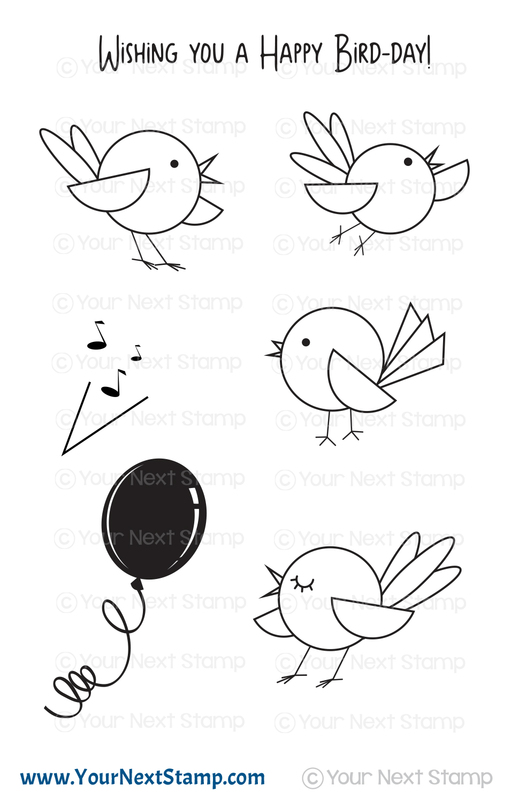 It is Feature Day with Your Next Stamp and it's all about Monochromatic. I don't know about you, but this is a challenge for me as I don't see things in one color. 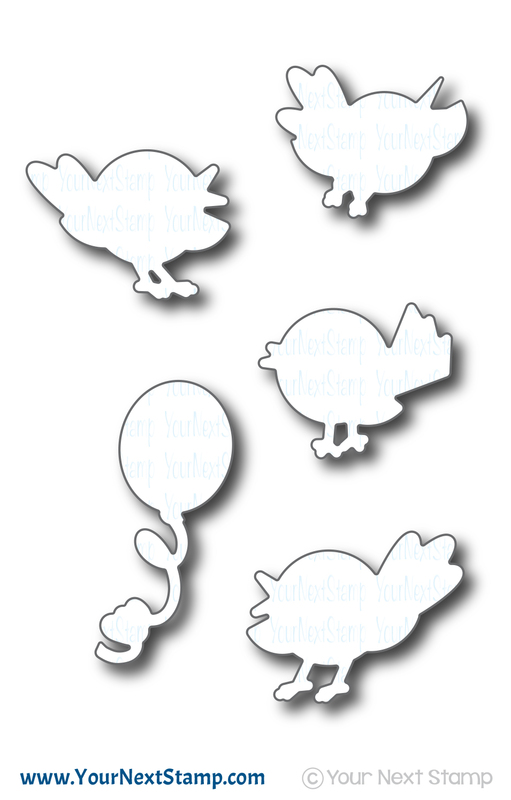 But I imagined some 4 Bar cards in a monochromatic theme and decided on making a set of three. 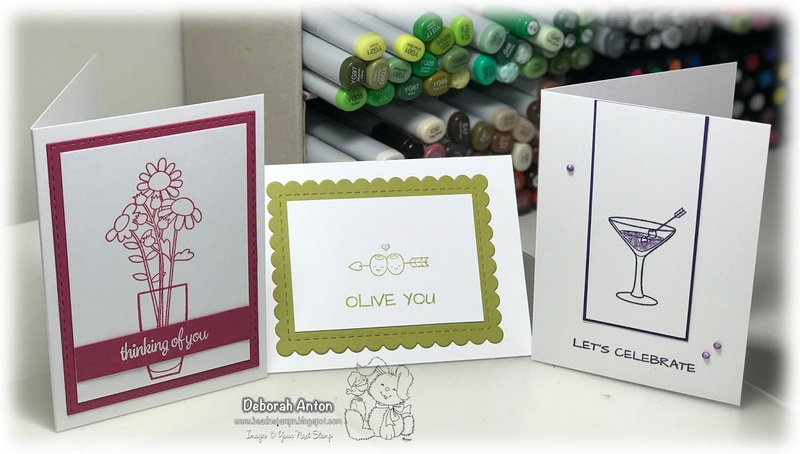 Three different cards for different occasions using both the 'Tini Sips set and Flower Bouquet set. For the red card, I cut the back panel using the YNS Stitched Rectangle die set and stamped the image in a matching ink from Memento. The sentiment was heat embossed with some white embossing powder. The panel on the olive card was cut using the YNS Scallop Stitched Rectangle die set and the image was stamped using a matching color. I completed that look with added a drop of Crystal Stickles to the heart. The purple martini was stamped in a matching purple ink and finished with some purple Stickles for added sparkle along with some purple rhinestones. CAS monochromatic cards small enough to tuck into a briefcase or lunch box, but large enough to mail and make someone smile. 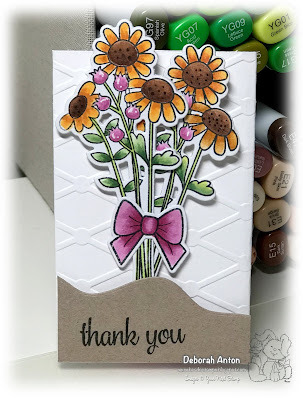 Be sure to stop by the YNS blog to see all the DT fab creations in a monochromatic theme! Thanks for stopping by and make it a great day! It's here! 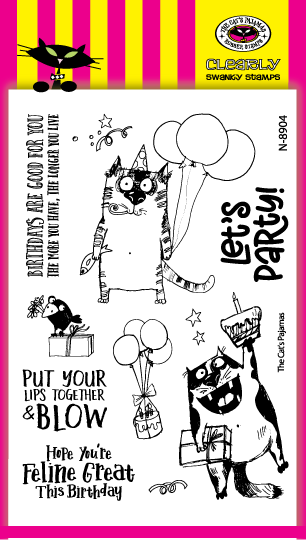 Sneaky peek week with The Cat's Pajamas Stamps! This release is so much fun and it's all about birthdays! I don't know about you, but I can always use new and fun birthday ideas. 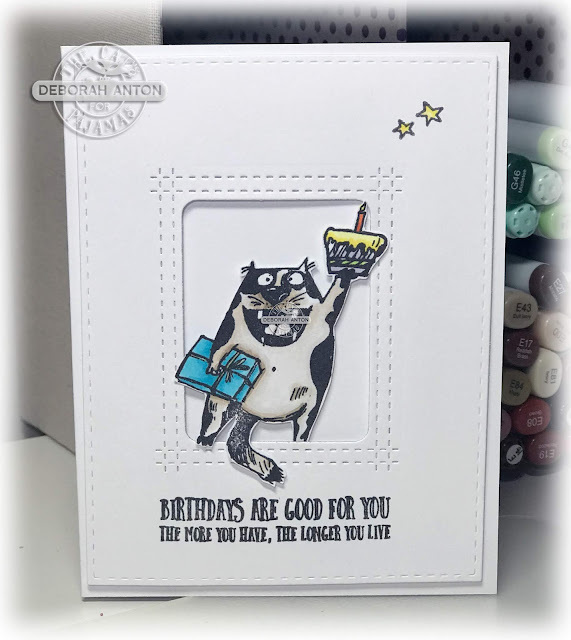 You will not want to miss this week peeks with the Kitty Cat Pack and be sure to have your paper and pen handy to keep a list of all your wants. 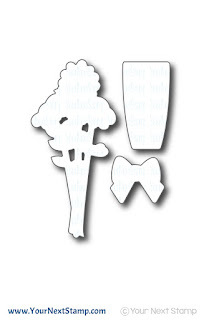 For my sneak, I am using the new set of It's all about the cake. 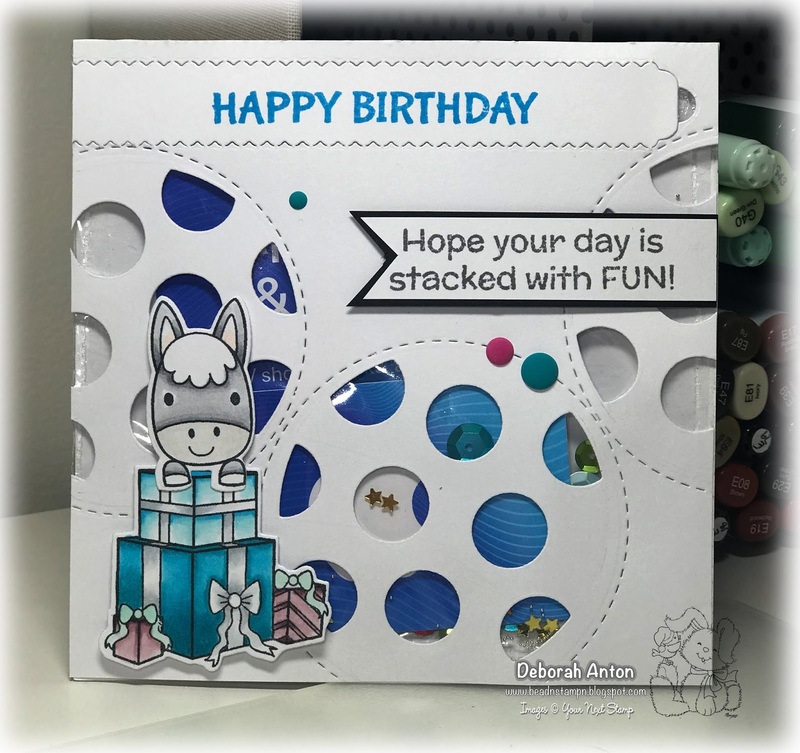 This is such a fun set perfect to create a great birthday celebration project - cake and all! 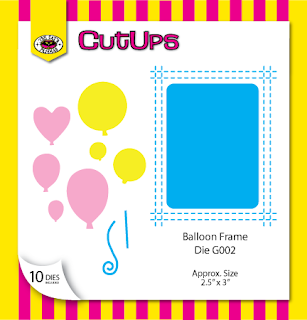 I used the die set of both the Birthday set and Balloon frame to get two different shapes of balloons to pop up. 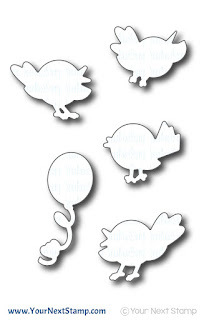 I stamped the balloons using the balloon images and some of the accent stamps images in the same set. The little bow and string were added to complete the look and the card was finished with some rhinestones on the balloons and some shimmer from my Wink of Stella pen. I added the sentiment using two sentiment lines from the same set. 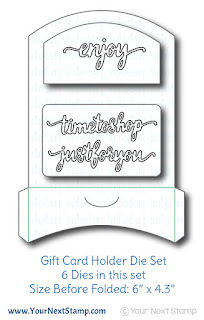 Be sure to leave a little love this week on either the Kitty Cat blogs or their Instagram account for your chance to win a $10 gift certificate to the TCP Store! Thanks for stopping by and hope you have a great Wednesday! Christmas is just a mere 4 1/2 months away. Gulp... really? 4 1/2? Eep!! 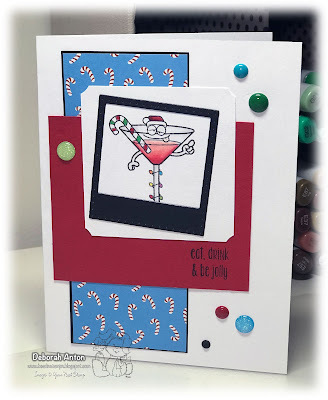 For this weeks challenge using the YNS Sketch, I decided to trigger my inner Christmas and use one of my favorite images - Holiday Martini. 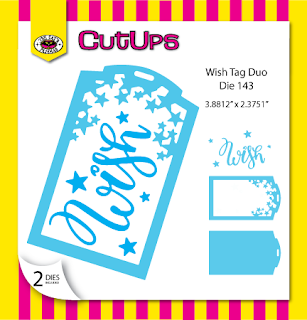 The YNS Store has both the regular size stamp set or this fun mini version (which also has a coordinating die!) I used on the card. That middle panel is really a true red color but the picture kept showing up as a raspberry color, so for argument sake, let's pretend we all see a true red! :) Using the YNS Holiday Joy paper collection, I used the candy cane pattern for the background and colored in my image with Copics. 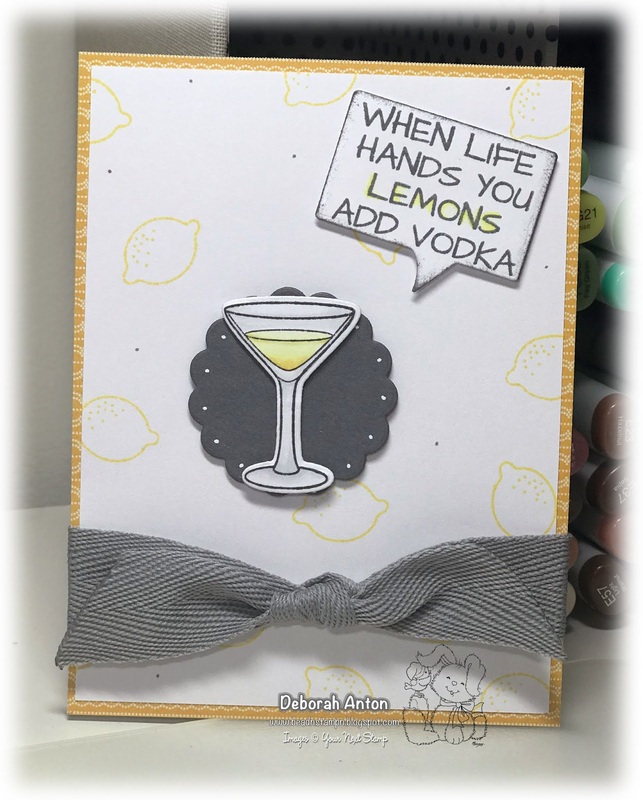 I used the Insta-love die set for the frame around the image, stamped the sentiment directly onto the cardstock, and finished the card with a few different fun Gumdrops. We hope you will be able to play along this week and if you do, be sure to link up your project on the YNS Challenge blog for your chance to win!! Thanks for stopping by and taking a peek. Have a great weekend! Ceeeelllebrate good times... Come on! (You just re-read that and sang it, didn't you? hahaha) Well, this month's YNS DT Dare is about Celebrations and there are so many things you can celebrate these days. It could be National Chocolate Chip Cookie day, National Wine Day, or even yesterday's Lefthanders Day! 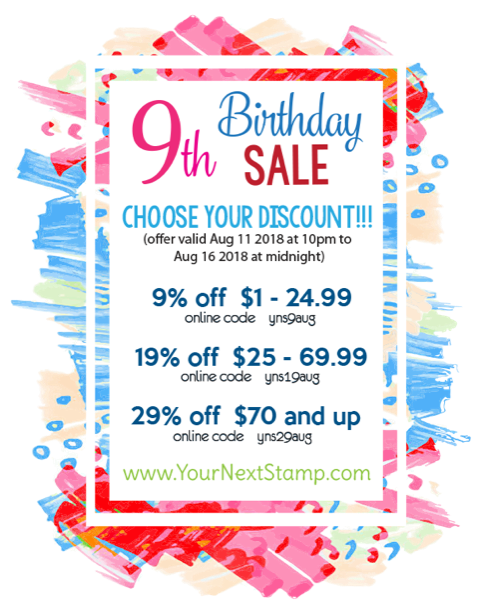 Shout out to my son... :) With all the choices you have to celebrate different days, the YNS Store has so many fun stamp sets and dies to help you get your creation just right! 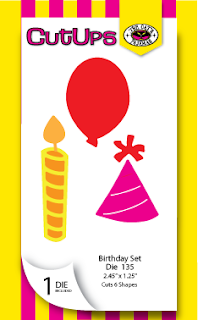 I have, however, stuck with the most common celebration to make my card and that would be birthdays. 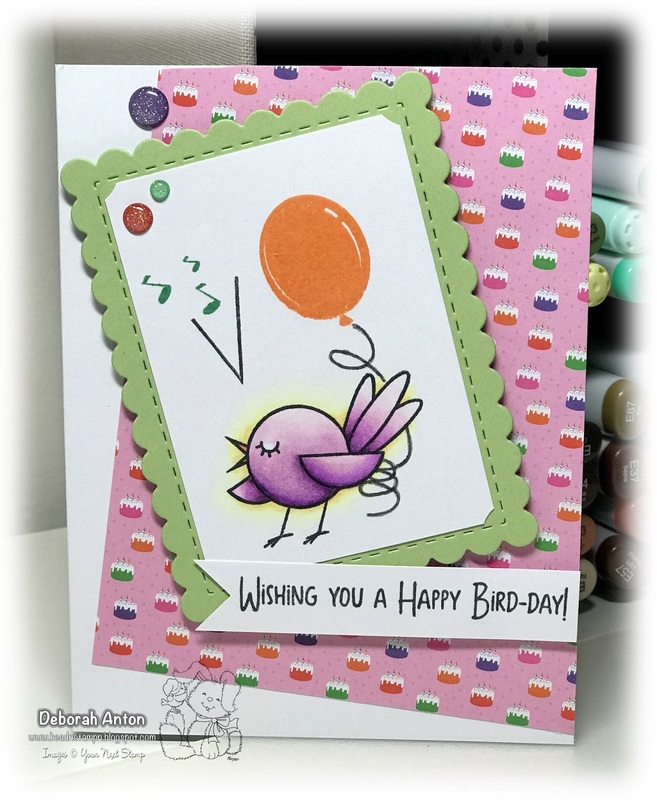 Using the new set of Happy Bird-day, I created this birthday card for the cute bird to sing at the top of his lungs. 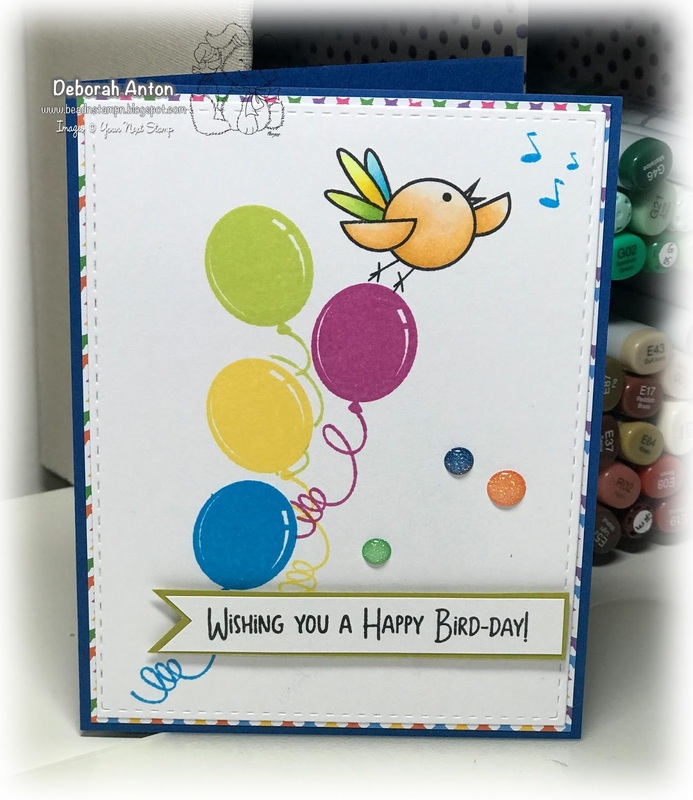 Using my Memento inks, I stamped the balloons in 4 colors masking in a few spots on the top panel cut out from the YNS Stitched Rectangle die set. This is layered over some patterned paper from the YNS Birthday Girl paper collection. I left some room at the top to add the bird and music notes. 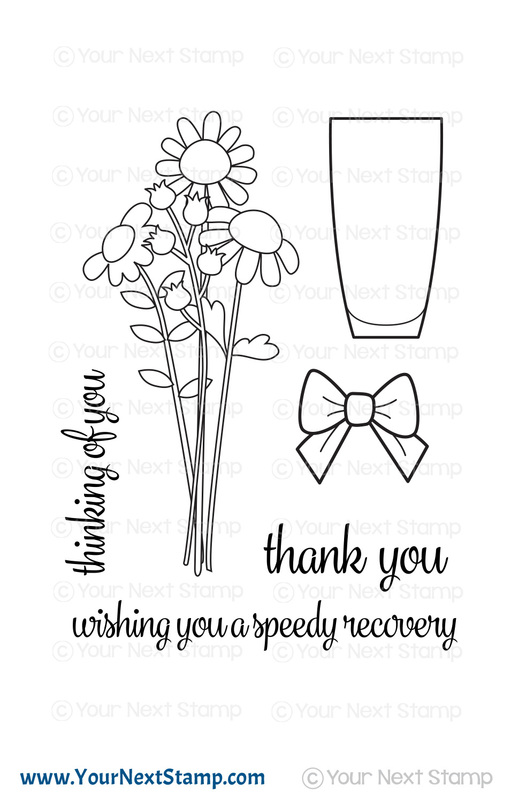 The card was completed with a popped up banner sentiment and some of the new Rainbow gumdrops. 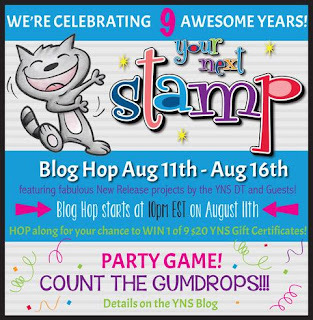 Be sure to stop by the YNS blog to see all the fun creations by the DT! Don't forget to leave a little love while you are there so you will have a chance to win a stamp set of your choice. Thanks for stopping by and have a great Wednesday!